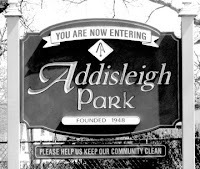 On Tuesday, March 2, 2010 (from 6:30-8:30pm) the New York City Historic Districts Council will offer a cultural resource survey presentation on Addisleigh Park, a little-known but culturally significant neighborhood in Southeast Queens. 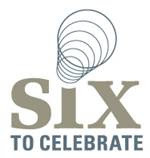 The event will be held at the Neighborhood Preservation Center, 232 East 11th Street, Manhattan. In 2007 HDC began an effort to document Addisleigh Park, home to numerous major African-Americans figures such as James Brown, Roy Campanella, W.E.B. DuBois, Count Basie, Lena Horne, Jackie Robinson and Ella Fitzgerald (to name just a few). Once completed, they submitted all the material to the Landmarks Preservation Commission, who recently calendared a historic district, partially in response to our work. This free program will allow participants a firsthand look at the research and learn more about this neighborhood and its storied past. The event is free to the public. Reservations are required, as space is limited. For more information, please contact Kristen Morith at (212) 614-9107 or kmorith@hdc.org. Organized in 1849 as a non-sectarian cemetery Evergreens Cemetery in Brooklyn (it actually borders Brooklyn and Queens) and covers 225 acres and is the resting place of over a half million people. This remarkable cemetery of rolling hills and gently sloping meadows features several thousand trees and flowering shrubs in a park like setting and is on the National Register of Historic Places. It is also the subject of an outstanding new book, Green Oasis in Brooklyn: The Evergreens Cemetery 1849-2008 by noted historian John Rousmaniere. This oversize book filled with unique and picturesque photographs by Ken Druse, traces the history of the Evergreens Cemetery beginning with the land on which the cemetery was founded, and it’s design by some of the most acclaimed architects of their time, Alexander Jackson Davis and Andrew Jackson Downing. It also shows how the forces that shaped the history of New York &#8211 population growth, immigration and growing wealth &#8211 also shaped the Evergreens. Among the monuments of fascinating characters buried there are those of Brooklyn’s Eastern District Fire Department (site of a statue memorializing a fireman who died in the Brooklyn Theatre Fire of 1876), Chinese American plots, the Triangle Shirtwaist Fire Memorial, Stranger’s mound (pauper’s graves), the graves of more then 500 entertainers, the 20th Regiment of U.S. Colored Troops plot, Yusef Hawkins (the 16-year-old African American youth who was shot to death in 1989 in Bensonhurst sparking racial tensions), Max Weber, Anthony Comstock, and literally thousands of other notable people. Take a listen to NPR’s recent tour of The Evergreens here. The pair met sometime around 1888, somewhere in bustling New York. By telling Copeland he was “James Todd,” a Pullman porter from Baltimore, King implied his race- a white man could not hold such a job. They married that year (though without obtaining a civil license), settling in Brooklyn and then, as Copeland had five children, Flushing, Queens. All the while King maintained residential club addresses in Manhattan, where colleagues knew him as an elusive man about town. Living a double life is costly, and King’s Western explorations never quite delivered returns, so the Todds were always broke. The beginnings of mountaineering in America have to be looked for mainly in early histories and narratives of travel, though the first ascent in the Canadian Rockies is chronicled in the supplement to a botanical magazine. The first magazine article upon American mountains seems to be Jeremy Belknap&#8216-s account of the White Mountains, printed in the American Magazine in Philadelphia in February, 1788. The first book was Joel T. Headley’s The Adirondack , published in 1849. The Alpine Journal of England, the earliest of such magazines, had a short account of a climb in Central America in its first volume, 1864, and in the third volume, 1867, there was an account of an ascent of Mt. Hood. The first book devoted to alpine climbing in America was Clarence King’s Mountaineering in the Sierra Nevada. As an aside, among the men who were associated with Clarence King was his good friend, artist John Henry Hill. 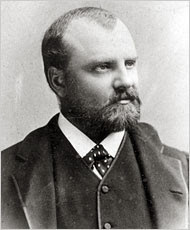 Hill accompanied King on two expeditions west (1866 and 1870) as a staff artist but his New York claim to fame is his work on the Adirondacks which he first visited in the 1860s. 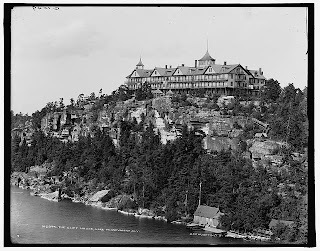 He camped and sketched throughout the Adirondacks, and from 1870 to 1874, lived in a cabin he dubbed &#8220Artist’s Retreat&#8221 that he built on Phantom Island near Bolton’s Landing, Lake George. During one winter, Hill’s brother, a civil engineer, visited and the two men set out on the ice to survey the narrows and make one of the first accurate maps of the islands which Hill than made into an etching “surrounding it with an artistic border representing objects of interest in the locality.” On June 6, 1893 Phantom Island was leased by the Forest Commission to prominent Glens Falls Republican Jerome Lapham.